1. Until very recently, he hosted the Late, Late Show, where he always seemed to be genuinely interested in the guests in the few clips that I’ve seen. 3. He used to be in a band with Peter Capaldi, who is currently playing Doctor Who. 4. He’s voiced a number of Scottish characters in animated movies that I’ve seen. 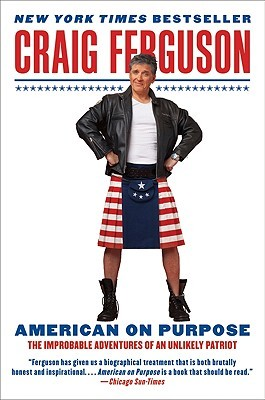 So I learned a lot about Mr. Ferguson while listening to this audio book, narrated by the man himself. He manages to recount stories that could be just tragic and depressing with wit and humour, without in any way hiding that for much of his life, he did not have an easy time of it. Growing up in a working class suburb to Glasgow in Scotland in the 60s and 70s seems pretty grim, although it’s quite clear that Ferguson’s parents had a much harder time of it. Apparently Ferguson’s dad didn’t own shoes until he was eleven. Still, as a teacher, listening to stories about how five-year-olds were belted for no obvious reason horrified me. I don’t actually think I could be a teacher in an education system that allowed corporal punishment. 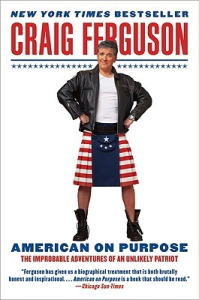 From early on in his life, Ferguson wanted to live in America, and he explains why in the book, while also talking about his very destructive alcoholism, his drug use, dropping out of school at sixteen to join the punk scene. While the stories he tells are funny, and alcoholism apparently saved his life (a friend distracted him with a pint of sherry on a Christmas morning when he had decided to commit suicide), Ferguson doesn’t hesitate to be honest about what a destructive force it was, either. As the daughter of a recovering alcoholic, and an uncle who died before he was sixty partially because he didn’t stop drinking, I have no illusions about alcholism being in any way glamorous or easy. I admire Ferguson for being so honest about his alcohol and substance abuse, as well as his process of becoming and remaining sober. I hadn’t realised that Ferguson wrote a novel, or that he wrote several screen plays, as well as being an actor and a stand-up comedian. He is very honest about the ups and downs of his career, and I wonder if he’s made himself unpopular in certain industry circles by being quite so up front about his experiences especially in the film he wrote and directed, that the studio apparently ruined completely. I finished this book in less than 24 hours, which I think may be a new record for an audio book. I had a lot of errands to run during the day, and this audio book kept me company. It also provided entertainment while I was working my way slowly and painstakingly through the complicated pattern part of the jumper I am knitting. Earlier in the week, I could easily knit while watching TV and even in the cinema, but now, that the pattern requires different colours of wool and careful attention, I can’t watch or read anything while knitting. I’m so glad I had this book to keep me company. I’ve read a number of celebrity autobiographies now, but this is by far the most honest, open and as a result, interesting one I’ve come across. I’m so glad I got this audio book. Thanks again, Narfna! Share the post "A really entertaining audio book"
Norwegian secondary school teacher, Geek and reading enthusiast. Married with two cats. Mother of little boy, born in February 2018. Cannonball-veteran. Loves fantasy, romance and YA. Pretty much hates Modernist lit and stream of consciousness writing, yet married a man whose favourite book is James Joyce's Ulysses, so there you go. Strongly opinionated about many things. I love this book. As an audio book of course. Great review. If you have access to them, I recommend his standup – Does This Need to be Said? This audiobook had my attention completely when I first listened to it, and it was a weirdly comforting listen as I was going to sleep on any re-listens.